TORONTO--(BUSINESS WIRE)-- Sherritt International Corporation (“Sherritt”) (TSX:S) today announced its 2018 production results and provided guidance for its expected production, unit costs and capital spending in 2019. Finished nickel production at the Moa Joint Venture (“Moa JV”) in 2018 was 30,708 tonnes, in line with guidance and indicative of efforts to overcome adverse weather conditions, transportation delays and hydrogen sulphide supply disruption experienced throughout the course of the year. Finished nickel production forecasted for 2019 at the Moa JV is expected to increase between 1% and 8% from 2018 results. Finished cobalt production forecasted for 2019 at the Moa JV is expected to increase between 2% and 11% from 2018 results. Net direct cash costs at the Moa JV are forecasted to be in the range of US$3.40 and US$3.90 per pound of finished nickel sold in 2019. The increase over 2018 guidance reflects the recent decline in cobalt prices and its impact on reduced by-product revenue. Sherritt’s share of capital spending for 2019 is forecasted at US$72 million, which will be primarily earmarked to replace existing equipment and infrastructure at the Moa JV as well as for drilling on Block 10. Nickel and cobalt production at the Moa JV in 2018 was 30,708 tonnes and 3,234 tonnes, respectively, largely in line with guidance. Year-end totals at the Moa JV for 2018 reflect actions taken to offset the negative effects that the highest level of rainfall in more than 20 years had on the production of mixed sulphides at Moa in Q1, transportation delays by the railway service provider to the refinery in Fort Saskatchewan in Q1 and the interruption in delivery of hydrogen sulphide in Q4 had on finished production. In 2019, nickel and cobalt production at the Moa JV is forecasted at between 31,000 and 33,000 tonnes and 3,300 and 3,600 tonnes, respectively. The forecasted totals for 2019 represent increases in production of up to 8% for nickel and up to 11% for cobalt from 2018 results. The anticipated increases reflect the completion of a number of initiatives in 2018 aimed at improving production reliability, including the acquisition of new mining equipment and the commissioning of a slurry preparation plant dump pocket that will reduce ore haulage distance. Nickel and cobalt production at the Ambatovy Joint Venture (“Ambatovy JV”) in 2018 were below guidance due to a number of factors, including the impact of Cyclone Ava, a category 2 hurricane-equivalent storm, that resulted in a plant shutdown and extensive equipment damage, production interruptions caused by the replacement of major pieces of equipment and the unreliability of acid plants for prolonged periods. Efforts to improve production stability and acid plant reliability at the Ambatovy JV are ongoing and underpin expected production growth in 2019 over 2018 results. Oil production on a net working interest basis is forecasted at between 1,800 and 2,100 barrels of oil equivalent per day in 2019. The forecast reflects natural reservoir declines from maturing fields and the reduction of Sherritt’s profit oil percentage to 6% with the renewal of the Puerto Escondido/Yumuri production sharing contract in March 2018. Oil production forecasts for 2019 exclude any anticipated contributions from Block 10 as drilling to reach the target reservoir continues. The Power business is forecasted to produce between 650 and 700 megawatt hours of electricity in 2019. The total is below 2018 production results due to the expected reduction of natural gas provided to Sherritt for power generation activities as a result of maturing oil fields off of Cuba’s north coast. Net direct cash costs (NDCC) at the Moa JV are forecasted at between US$3.40 and US$3.90 per pound of finished nickel sold. Net direct cash costs are based on by-product credits and input commodities that are subject to considerable change given the volatility of cobalt, fertilizers, crude oil, natural gas and sulphur prices. The NDCC forecast for the Moa JV is also subject to the seasonality of fertilizer sales, which are typically higher in the second and fourth quarters. The NDCC forecast for 2019 is higher than NDCC realized in 2018 largely due to the recent decline of cobalt reference prices. NDCC for 2019 is based on a forecast cobalt reference price of US$25.00 per pound and a forecast average sulphur price of US$170 per tonne including freight and handling. NDCC at the Ambatovy JV is forecasted at between US$3.80 and US$4.30 per pound of finished nickel produced. Although Ambatovy’s production is forecasted to be higher in 2019, its NDCC is anticipated to be higher than realized in 2018 due largely to the decline in the cobalt reference prices and higher input costs. Oil production costs in Cuba in 2019 are forecasted to be between C$25.00 and C$26.50 per barrel. The forecasted unit costs are higher than realized in 2018 because of anticipated lower production. Operating costs for Power are forecasted to be between C$25.25 and C$26.75. The forecasted increase in unit costs relative to 2018 is due to the anticipated reduction in production. Sherritt’s share of capital spending at the Moa JV and at the Fort Site is forecasted at US$40 million in 2019, consistent with 2018 guidance. Capital spending in 2019 is planned for the replacement of aging trucks and infrastructure, including a fertilizer conveyor. Capital spending at the Ambatovy JV based on Sherritt’s ownership interest is forecasted at US$10 million. Spending planned for 2019 includes projects to improve acid plant reliability and address corrosion issues as well as for process improvement projects to support the production ramp up. Capital spending at the Oil and Gas business is forecasted at US$21 million. The forecasted spend is planned for the completion of drilling of the current well in Block 10 as well as for ongoing operations. The timing and amounts of capital spending within the Oil and Gas business will vary depending on the collection of overdue receivables. Any incremental capital spend at the Oil and Gas business in 2019 will be predicated on successful drill results at Block 10. Please dial-in 15 minutes before the start of the conference to secure a line. The conference call discussion will include a presentation that will be available from Sherritt’s website. 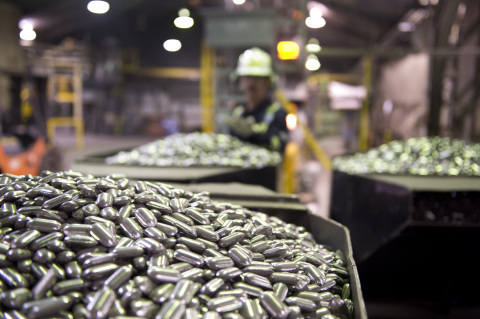 Sherritt is the world leader in the mining and refining of nickel from lateritic ores with projects and operations in Canada, Cuba and Madagascar. The Corporation is the largest independent energy producer in Cuba, with extensive oil and power operations across the island. Sherritt licenses its proprietary technologies and provides metallurgical services to mining and refining operations worldwide. The Corporation’s common shares are listed on the Toronto Stock Exchange under the symbol “S”. This press release contains certain forward-looking statements. Forward-looking statements can generally be identified by the use of statements that include such words as “believe”, “expect”, “anticipate”, “intend”, “plan”, “forecast”, “likely”, “may”, “will”, “could”, “should”, “suspect”, “outlook”, “potential”, “projected”, “continue” or other similar words or phrases. Specifically, forward-looking statements in this document include, but are not limited to, statements regarding future guidance and forecasts set forth in this press release and certain expectations regarding production volumes; operating costs and capital spending; changes in the global price for nickel, cobalt, oil and gas or certain other commodities; supply and demand in the nickel and cobalt markets; anticipated payments of outstanding receivables; uncertainty of drilling plans and exploration results and Sherritt’s ability to replace depleted mineral and oil and gas reserves; the possibility of equipment and other failures; the potential for shortages of equipment and supplies; future distributions from the Moa Joint Venture; and amounts of certain other commitments. Forward looking statements are not based on historical facts, but rather on current expectations, assumptions and projections about future events, including commodity and product prices and demand; the level of liquidity and access to funding; share price volatility; production results; realized prices for production; earnings and revenues; development and exploration wells and enhanced oil recovery in Cuba; environmental rehabilitation provisions; availability of regulatory approvals; compliance with applicable environmental laws and regulations; debt repayments; collection of accounts receivable; and certain corporate objectives, goals and plans. By their nature, forward looking statements require the Corporation to make assumptions and are subject to inherent risks and uncertainties. There is significant risk that predictions, forecasts, conclusions or projections will not prove to be accurate, that those assumptions may not be correct and that actual results may differ materially from such predictions, forecasts, conclusions or projections. The Corporation cautions readers of this press release not to place undue reliance on any forward looking statement as a number of factors could cause actual future results, conditions, actions or events to differ materially from the targets, expectations, estimates or intentions expressed in the forward looking statements. These risks, uncertainties and other factors include, but are not limited to, changes in the global price for nickel, cobalt, oil and gas or certain other commodities; share price volatility; level of liquidity; access to capital; access to financing; risks related to the liquidity and funding of the Ambatovy Joint Venture; the risk to Sherritt’s entitlements to future distributions from the Moa and Ambatovy joint ventures; risk of future non-compliance with debt restrictions and covenants; risks associated with the Corporation’s joint venture partners; variability in production at Sherritt’s operations in Madagascar and Cuba; potential interruptions in transportation; uncertainty of gas supply for electrical generation; uncertainty of exploration results and Sherritt’s ability to replace depleted mineral and oil and gas reserves; the Corporation’s reliance on key personnel and skilled workers; the possibility of equipment and other failures; the potential for shortages of equipment and supplies; risks associated with mining, processing and refining activities; uncertainty of resources and reserve estimates; environmental risks and risks related to rehabilitation provisions estimates; risks related to the Corporation’s corporate structure; political, economic and other risks of foreign operations; risks related to Sherritt’s operations in Cuba; risks related to the U.S. government policy toward Cuba, including the U.S. embargo on Cuba and the Helms-Burton legislation; risks related to Sherritt’s operations in Madagascar; risks associated with Sherritt’s development, construction and operation of large projects generally; risks related to the accuracy of capital and operating cost estimates; foreign exchange and pricing risks; compliance with applicable environment, health and safety legislation and other associated matters; risks associated with governmental regulations regarding greenhouse gas emissions; risks relating to community relations and maintaining the Corporation’s social license to grow and operate; credit risks; shortage of equipment and supplies; competition in product markets; future market access; interest rate changes; risks in obtaining insurance; uncertainties in labour relations; uncertainty in the ability of the Corporation to enforce legal rights in foreign jurisdictions; uncertainty regarding the interpretation and/or application of the applicable laws in foreign jurisdictions; legal contingencies; risks related to the Corporation’s accounting policies; risks associated with future acquisitions; uncertainty in the ability of the Corporation to obtain government permits; risks to information technologies systems and cybersecurity; failure to comply with, or changes to, applicable government regulations; bribery and corruption risks, including failure to comply with the Corruption of Foreign Public Officials Act or applicable local anti-corruption law; uncertainties in growth management. Readers are cautioned that the foregoing list of factors is not exhaustive and should be considered in conjunction with the risk factors described in this press release and in the Corporation’s other documents filed with the Canadian securities authorities, including without limitation the Annual Information Form of the Corporation dated March 20, 2018 for the period ending December 31, 2017, which is available on SEDAR at www.sedar.com. 1 Nickel and cobalt production are presented on a 100% basis. Sherritt’s share varies by business unit, with the Moa JV being a 50% joint venture, Ambatovy a 12% investment in an associate, and Power a 331/3% interest. 2 All 2018 guidance figures are as of Q3 2018 as reported on October 31, 2018. 3 Capital spend is based on Sherritt’s ownership interests in the Moa Joint Venture (50%); Fort Site (100%), Ambatovy (12%), Power (331/3%).